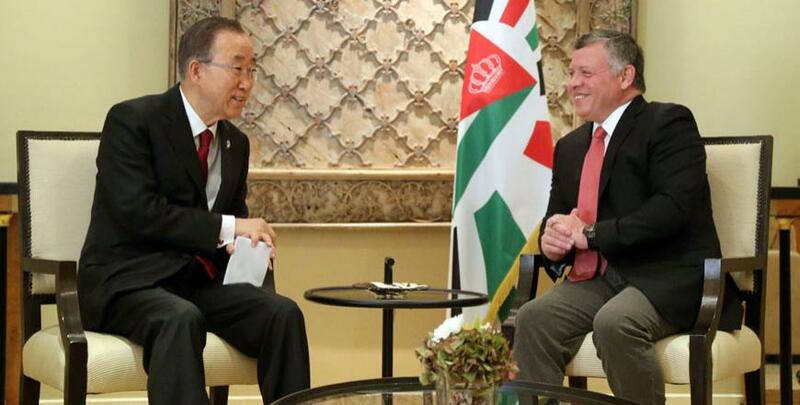 AMMAN — His Majesty King Abdullah on Thursday highlighted the Jordanian role in defending Jerusalem in line with the Kingdom’s religious and historic duty and the Hashemite custodianship of the city's Islamic and Christian holy sites. At a meeting with UN Secretary General Ban Ki-moon, His Majesty warned against any attempts to change the status quo at Al Aqsa Mosque and Al Haram Al Sharif, according to a Royal Court statement. The King noted that reaching a comprehensive and just peace according to the two-state solution is the only exit from regional crises, a goal that requires all parties to exert their utmost efforts in support of achieving the envisioned solution. For his part, the secretary general briefed the King on the outcome of his tour of Palestine and Israel, stressing the important Jordanian role and the Hashemite custodianship of Jerusalem's holy sites, the statement added. 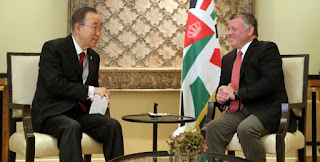 According to a UN statement, the UN chief “briefed the King about his meetings with Israeli and Palestinian leaders in which he appealed to them to put an end to the continuing violence in Jerusalem, the West Bank and Israel”. The UN official referred to the international community’s responsibility for reaching a comprehensive and just solution to the Palestinian issue. Both sides also stressed that the lack of a vision for solving the Palestinian-Israeli conflict increases tension, and is likely to inflame a religious war in the region and lead to worsening of a situation whose repercussions would affect all, according to the statement. Royal Court Chief Fayez Tarawneh and King’s Office Director Jafar Hassan also attended the meeting.